You know how when all of your projects seem to be clunkers and you need an easy pick me up? This is just the thing. Its unique industrialness appealed to me. For $1.30, why not? (I also could not resist the 80 cent small version as a ring.) 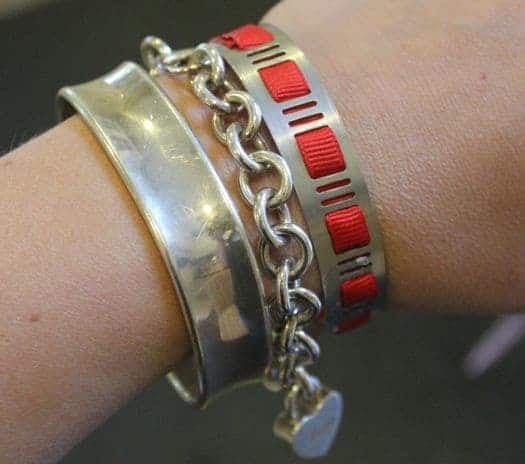 And you can make it into what I like to call a DIY Home Depot bracelet. The best part – it’s adjustable! 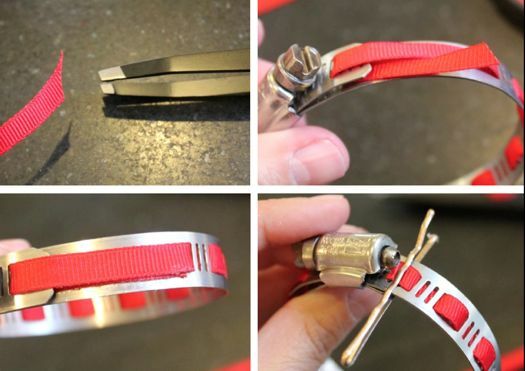 You just turn the little screw to make it as small as you need for your wrist. To add a bit of color, I weaved in some 1/4 inch ribbon. But I also like it plain. Glue the ends with E-6000 and clamp to dry. Now if I can just figure out what to do with the paint chips I pilfered…. Hi, This is a great start…i’m not wild about the adjustable part remaining attached so I’m going to try to weld it (once my hubby shows me). The idea is great. I’ve used the plastic hosing they have for making candy-filled bracelets. Also, i’ve picked up many of the free carpet samples, glued cork board to the back and used for coasters. The paint chips can be used for scrapbooking. Great job! thanks! candy filled bracelets sound awesome, too! Love the idea! I love hardware departments…. eye candy for the what can I do with that soul!!!! BTW… I pilfered quite a collection of the paint chips! I had so many in my fist one day when I checked out of HDepot the lady at the register asked me if I wanted a bag for them! LOLOLOLOL….. I used them for doing mosaics.. wish I could attach a photo! genius! I love the ribbon! I LOVE this idea!! (Especially the ring!) But I’m a bit more girly than that, so I’m thinking some hot-fix rhinestones on the clamp part itself to make it more of a focal point? love this as hubby is a mechanic by trade. He won't get how cool it is but thats ok. Thank you! The chain/charm bracelet is from Tiffany – it was a present from the hubster after our daughter was born. :) So glad you stopped by! Hi Stephanie! Just wanted to let you know I'm featuring this on my blog! Come grab a button! I like this. Thank you for idea!!! 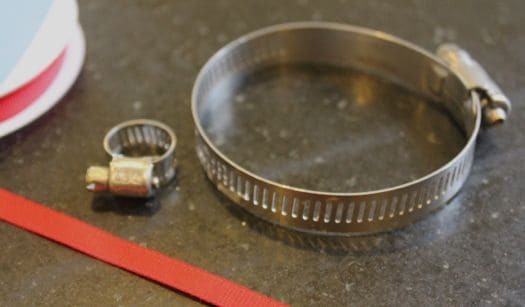 I also share my idea how to make another bracelet. What a great idea! I love the industrial-ness made soft with the ribbon! Found you via the Southern Lovely party! LOVE IT. It's amazing where inspiration comes from! So stinkin' cute! LOVE! I often buy my crafting "supplies" at home improvement stores too! A giant roll of drywall tape is MUCH cheaper than that mesh that you buy at the craft stores! lol Thanks for sharing! Thanks so much for linking up to my new party! I feel like the new kid at school…worried no one would play with me so thanks for playing! Amazingly cool! I know what I'm gonna do this week. Paint chips make great book marks and ornaments! I pilfer paint chips all the time. I made a baby shower gift with paint samples, an elephant punch and a picture frame. 25 elephant punches each one a slightly different shade of blue. In neat rows 5×5 in a frame. SO creative!! The hardware idle is full of great inspiration for sure! 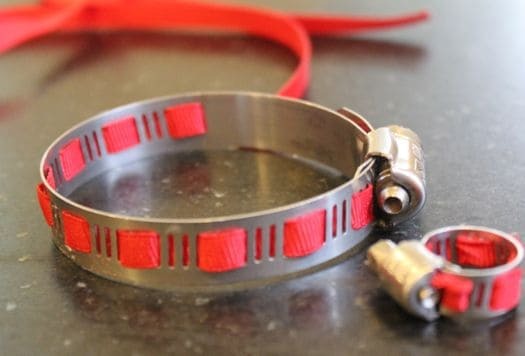 I love the hose clamp bracelet! 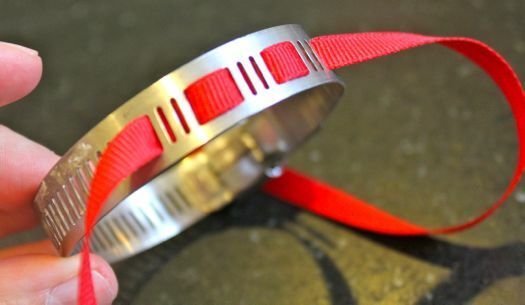 Ribbon is one of my favorite things and the contrast with the metal is great! 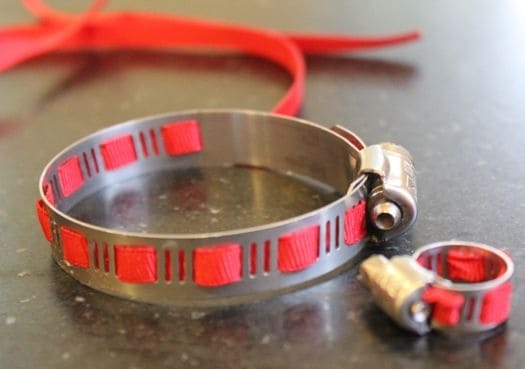 this is GREAT….probably my favorite of your DIY accessories. I need to get one! So industrial chic…. What a great idea! My daughter LOVE the Home Depot. I told my husband he needs to bring her there someday so she can spend a good chunk of time looking around and asking him what stuff is cause I don't have a clue! That bracelet is so awesome! How creative!! LOVE! This is my favorite so far! You are SO creative! You're just way too clever Stephanie, although I think my ex-mechanic husband will get a laugh out of it. I love it! Seriously so creative! You are amazing!